Professor Ernest Aryeetey has bid the University of Ghana (UG) farewell after six years of meritorious service as the Vice Chancellor. “To the Chancellor, the Chairman and members of the University Council, management, officers of the University, staff, successive student leaders and other stakeholders of this University, I owe a debt of gratitude to you for your support and commitment. “As a University, we would not have been able to make the strides we have over the past six years without your commitment and support,” Prof Aryeetey stated in his report at the University’s College of Basic and Applied Sciences congregation in Accra. He would be handing over to Prof Ebenezer Oduro Owusu at the end of July, after attaining the compulsory retirement age of the University. The congregation is the first of two sets of graduating ceremonies for students who completed their studies in the 2015/2016 academic year; the second set of ceremonies would be held in November. For the first set, a total of four ceremonies were held over the weekend to award degrees and diplomas to a total of 3,590 students graduating from four colleges. The graduating students were made up of 2,142 diplomas and undergraduates and 1,448 post graduates. Prof Aryeetey, who gave an overview of his six-year tenure, said the University had pushed steadily towards significant improvements in teaching and learning, with a major concentration on quality assurance and the provision of new equipment. He said these efforts have been rewarded with significant improvement in the performance of students and faculty. He mentioned that in the most recent Times Higher Education (THE) World University Rankings, the UG ranked seventh in Africa, making it the highest ranked university in the West African sub-region. He said the Office of Research, Innovation and Development was established in 2010 to promote and manage research in the University and also to help raise the profile of research, as part of the effort to transform UG into a world-class research-led institution. He said in 2011, the first substantive Pro-Vice Chancellor for Research, Innovation and Development was appointed to help in reshaping and enhancing the research profile of the University. Prof Aryeetey urged the graduating students to take every situation as a learning opportunity; and exercise temperance in all their endeavours. Prof Jane Naana Opoku-Agyemang, the Education Minister lauded the out-going Vice Chancellor and his team of management for transforming the University. 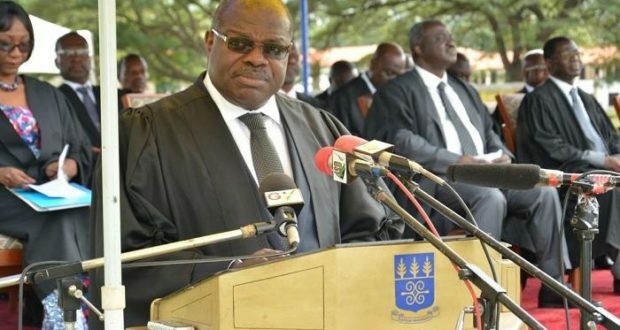 Mr Justice Samuel K. Date-Baah, the Chairman of UG Council, on behalf of the Council also commended Prof Aryeetey for successfully steering the affairs of the University over the past six years. Ms Angela Kyerematen-Jimoh, the Country General Manager of IBM Africa, who was the guest speaker, challenged the graduands to go out and be relevant, and relentlessly reinvent themselves, build resilience in themselves and in their organisations.